All publications begin with a template, even if it’s a blank template. The trick is to find a template that looks like the vision you have for your final publication. Publisher comes with built-in templates. Choose one of the Featured templates, and click Create. To use one of the templates installed in Publisher, choose Built-in, scroll to click the category you want, choose a template, and click Create. 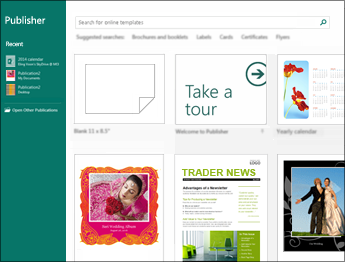 To find a template on Office.com, use the Search for online templates box to find what you need. Enter “newsletter,” for example, scroll to a template you like, and click Create. Save your publication the first time by following these steps. In Save As, choose where you want to save your publication. 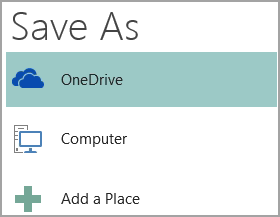 OneDrive is a free Microsoft service that provides password-protected online file storage. Other Web Locations includes websites you’ve used recently, and a Browse button to save your publication to any website you have access to. Computer includes any folder on your computer. Add a Place lets you add an online location to save your publication. Enter the name for your publication, and click Save. After you’ve saved your publication once, you can simply click File > Save each time you want to save. If you want to change the file name or location of your publication, click File > Save As, and save the publication as if you were saving for the first time. Use the options in the Insert Pictures dialog box to find the picture you want to use. Building blocks are reusable pieces of content such as headings, calendars, borders, and advertisements. Publisher has built-in building blocks, or you can create your own. 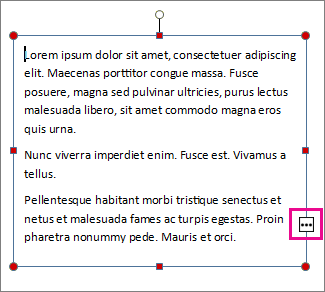 In the Page Navigation pane, select a page in your publication. On Insert > Building Blocks, pick a building block gallery. Under Print, enter the number of copies to print in Copies of print job box. Note: The properties for your default printer are automatically entered for you. Make sure the correct range of pages or sections is selected. 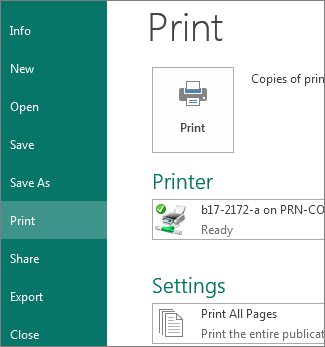 Select the layout format for printing. Set whether to print on one side of the paper or on both sides. If your printer is capable of color printing, choose whether you want to print color or grayscale. Click the Print button when you are ready to print.